On 3 July 2018, the first of 10 new counter-poaching dogs arrived at South Africa’s OR Tambo International Airport from Texas, USA. These specially trained, free-running pack dogs are joining a highly motivated K9 Unit at the Southern African Wildlife College. Once settled and accustomed to their new handlers, they will be deployed in counter-poaching operations in the Greater Kruger area. Pack dogs in training in the USA. “We are incredibly excited to be working with these dogs. Our early successes with free-running pack dogs have shown us how effective they are in the field. These dogs are also trained in apprehension work and will actively help rangers stop poachers in their tracks,” said the College CEO, Theresa Sowry. While on-leash tracker dogs are commonly used by counter-poaching teams, pack dogs that run off leash are relatively new to the scene, but already proving their worth. They can track at high speeds over even the most difficult terrain; recent exercises have seen them cover 30 kilometers in two hours. Their top speeds, measured regularly over short distances, are around 40 kilometers per hour! 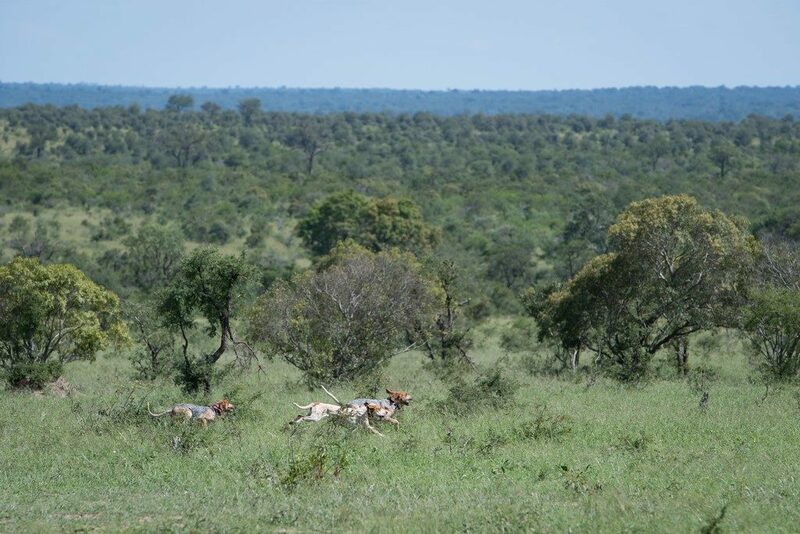 Using aerial support to follow the dogs allows the rangers to catch up valuable time in the field. The new dogs are a cross between Black and Tan and Redbone breeds. They have been bred for nearly a century in the USA to track humans for law enforcement purposes. The College will begin working with these dogs to be able to deploy them to hold poachers at bay while waiting for rangers to arrive. As the demand for well-trained dogs and handlers grows, there is potential for the College, as a SADC training institute, to play a major role in replicating the K9 Unit’s early successes in protected areas throughout Africa. 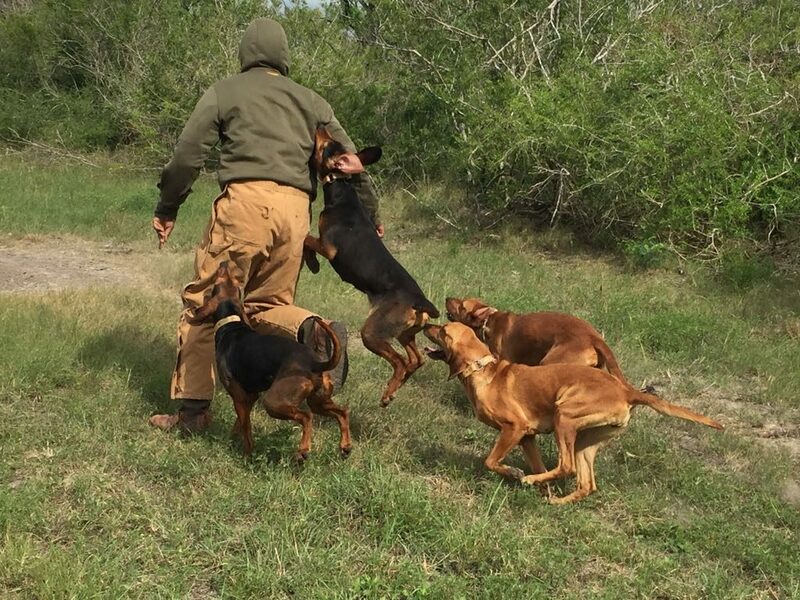 “When I found out what is really going on in southern Africa – how serious and destructive the poaching crisis is – I thought, if I can do something to help, I’m going to do it,” said Texas houndsman Joe Braman, who has 35 years of experience working with dogs to positively impact wildlife conservation efforts. Pack dogs prepped and ready to fly from Texas. 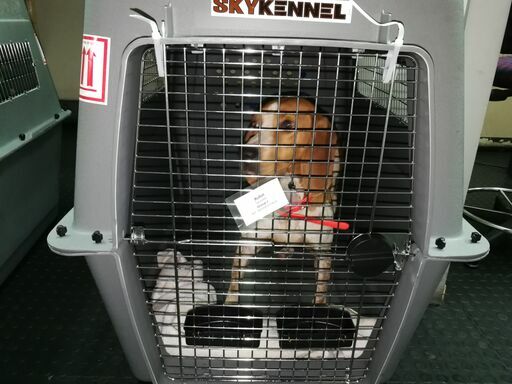 Pack dogs landed safely in Johannesburg. The Ivan Carter Wildlife Conservation Alliance, and its donors, including the Nelson Pruett Foundation, have provided valuable support for the transport and ongoing expenses of this valuable pack of hounds in the USA. Other South African-based donors that have generously pledged their support include Global Paws, which assisted with the applications for the dogs’ import permit authorisations and customs pre-clearance. In addition, Global Paws paid the dogs’ handling fees and were present for their checks on arrival by the state veterinarian. South African Airways Cargo – introduced to the project via WWF South Africa – flew the dogs to South Africa. 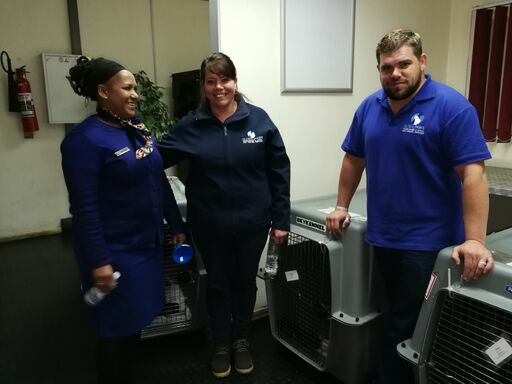 Once all the dogs have arrived – a maximum of five can be transported per flight given their size – they will travel to the College’s state of the art K9 Unit, which was established in 2015 with funding from the WWF Nedbank Green Trust. Further assistance generously provided by the International Fund for Animal Welfare (IFAW) helps support the unit’s increasing running costs. Running off leash, pack dogs regularly reach speeds of up to 40 kilometres an hour.